“My Cherie Amour” has never been a favourite song of mine. In terms of the Motown catalogue alone, there are scores, probably hundreds, I think of with greater fondness. But Beverley Skeete and Noel McKoy changed that at the Festival Hall on Saturday night, when the Stevie Wonder chestnut was sung by the duo in a captivatingly elaborate arrangement that featured Gary Crosby’s Jazz Jamaica All-Stars augmented by 15 horns and a dozen strings. The occasion was a concert titled Love Motown, a follow-up both to Jazz Jamaica’s Motorcity Roots album of 2008 and last year’s celebration of the 40th anniversary of the Wailers’ Catch a Fire. Like the latter event, it featured the big band — mostly drawn from Crosby’s Tomorrow’s Warriors project — plus the 200-member Voicelab choir, whose enthusiasm was channelled to good effect. This was not about cover versions. It was about creative reinterpretation through the lens of an Anglo-Caribbean sensibility, using the special qualities of the Jazz Jamaica musicians. So Crosby’s bass and Rod Youngs’ excellent drumming evoked Aston and Carlton Barrett rather than James Jamerson and Benny Benjamin, often jettisoning the factor that distinguished the original — the riff on which Holland, Dozier and Holland built “This Old Heart of Mine”, for example — and setting the song free. Circa 1978 Brian Wilson told my pal Tom Ingerick he thought My Cherie Amour was pure genius and one of this fave songs of all time by anyone, anywhere. He then played it for Tom on the piano in a rather battered tavern where they were just north of San Diego on the coast, both of them killing an afternoon busy doin’ nuthin’. Tom said it was profoundly moving and changed his opinion of the song from schmaltz to grandeur. I think it was ’97, and I booked Jazz Jamaica to play at the Gatehouse, as part of a British music weekend, also featuring Waterson Carthy and someone else whose name escapes me now. This was to be the start of a new annual event called Stafford’s Spring Gambol. Unfortunately Gary Crosby cancelled on me – with my agreement, having known him from Camden days we were on friendly terms – to capitalise on some overseas tour opportunity, promising a really good deal for another date. We never did that other date, and to my mind Spring Gambol remains a great unused event name…. 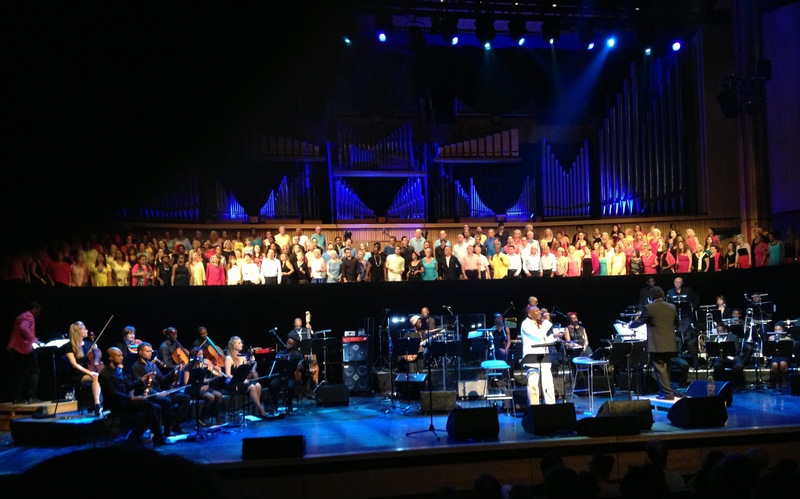 I also went to the ‘Love Motown’ concert at the South Bank on Saturday and enjoyed it immensely – a lovely evening. But it was somewhat frustrating to be confronted with so many unfamiliar musicians and for so few of them to be introduced by name to the audience. Perhaps there were just too many on stage to introduce them all individually, but I would love to know more about the young lady in the horn section who reeled off a couple of marvelously fluent sax solos in the first half. And the young guitarist, who provided immaculate rythmn support throughout the evening and contributed a sublime solo to the Commodores piece – fantastic; but who is he? Very many thanks – particularly for confirmimg the identity of the guitarist! Must get my eyes tested – or maybe I was just fooled by Shirley’s headwear! Anyway, on Saturday’s evidence, Shirley Tetteh is a real talent on guitar, and I guess that Camilla George is the sax player that impressed me so much – I’ll be looking out for both of them in future, along with the rest of the fine musicians and singers on the stage on Saturday. Again, many thanks for seeking out the personnel listing – very much appreciated. Thank you Graham for your kind comments. I’m really glad you enjoyed the gig!